IN a shocking twist, police have tagged the wife of race car driver Enzo Pastor as one of the suspects in the slaying of the motorsports champion last June. Dalia Guerrero Pastor's possible involvement in her husband’s murder was raised by police during a press conference at Quezon City Police District headquarters in Camp Karingal on Wednesday afternoon. 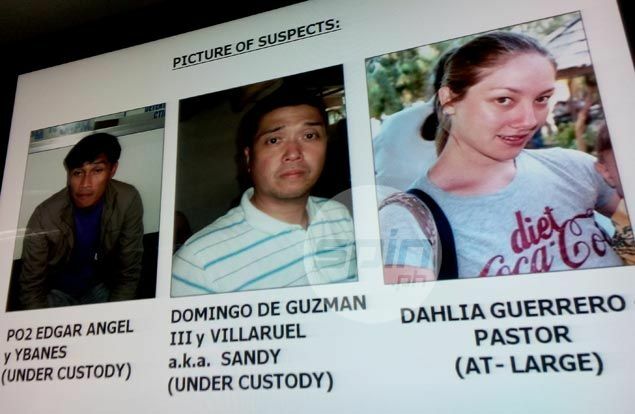 P/ Chief Inspector Rodel Marcelo, chief of the QCPD Criminal Investigation and Detection Unit, said investigation showed Dalia has links with Domingo “Sandy” de Guzman III who police tagged as the alleged mastermind behind the killing. Police said they are now looking for Pastor’s widow and mother of their two young children for questioning. The break in the two-month old case occurred last Saturday when PO2 Edgar Angel, 42, was arrested in a buy-bust operation in Libis, Quezon City where he was caught selling almost 100 grams of shabu to undercover police. Police said Angel, a Pasay City cop, admitted during interrogation of his participation in Enzo’s killing. He later confessed to have been hired by de Guzman to kill Pastor for a P100,000 fee, police added. Marcelo said Angel’s name surfaced as early as three weeks after the June 12 killing but admitted that investigators at the time lacked sufficient evidence to pin him down. De Guzman, himself a race car driver and managing partner of a custom shop that services high-end sports cars, was arrested in an entrapment operation by the QCPD on Tuesday afternoon in Sto. Nino Village in Muntinlupa City. The 40-year old De Guzman, who police said was unaware that Angel was already in custody, was arrested after handing a P50,000 cash ‘bonus’ to the gunman. Confiscated from him were two loaded pistols - a .45 and a 9mm Beretta - and a Toyota Corona. The suspects are currently detained in Camp Karingal and are set to be brought to the Quezon City Prosecutor’s Office for inquest proceedings. According to police, Angel confessed they have been planning the murder as early as December last year. Philippine motorsports advocate Tom Pastor, Enzo’s father, said his family is “shocked” by Dalia’s alleged involvement. The elder Pastor admitted he had little communication with her daughter in law since his son's death. The last time they communicated was during the 40th Day commemoration of Enzo’s demise, where Pastor said he even saw de Guzman. He and his wife thanked Task Force Enzo Pastor for the arrests. He later told reporters that he would only consider the case closed after all the suspects, including his daughter-in-law, are in police custody to face trial. The slaying of Enzo Pastor was among high-profile murder cases mentioned by President Aquino in his State of the Nation Address. Aquino assured the police would pursue the investigation to a successful conclusion.